Dare to explore in style with the equivalent of a professional sports instrument on your wrist, providing you with 13 different functions, accessible through a simple fingertip touch. With the new touchscreen technology on the rise, this timepiece is a “must have” accessory. 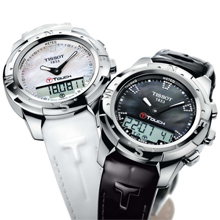 The Tissot T-Touch II Lady combines cutting-edge technology and trend with feminine charm, to provide functionality and feminine class for today’s smart and adventurous women leading action-packed lifestyles. 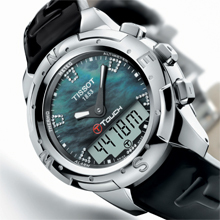 The compass and weather forecast function along with the new improved altimeter and the water resistance of up to a pressure of 10 bar (100 m / 330 ft) ensure that this watch is the right partner to accompany you on the journey of your choice, whether on a mountain top skiing through life or exploring the deep blue sea. A mother-of-pearl and diamond finish provide this timepiece with sophistication and class to suit even the most elegant of adventurers. It is the perfect complimentary accessory to shine with confidence while having cocktails on a rooftop garden or skiing in the Swiss Alps. For the first time, this timepiece is presented with a black patent bracelet and a luxurious black mother-of-pearl dial, giving the watch that extra shine and glamour to better suit that stunning black dress. The watch is also available with a polished titanium, a white silicone or a black or white leather bracelet and with a choice of a dial with indexes or Top Wesselton diamonds, offering the individualisation possibilities that today’s women expect. 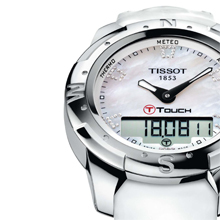 Let every facet of yourself shine through with the new Tissot T-Touch II Lady.